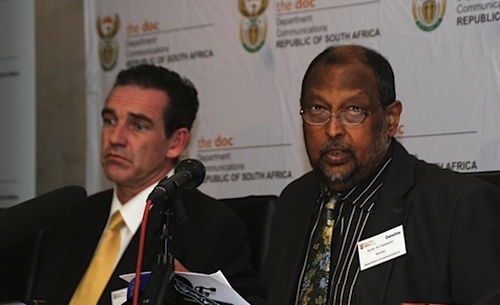 Communications minister Roy Padayachie hosted technology industry leaders at a roundtable on Friday to discuss ways of growing the sector and creating jobs. High-profile attendees included Vodacom Group CEO Pieter Uys, MTN Group CEO-designate Sifiso Dabengwa, Dimension Data SA chairman Andile Ngcaba, Sahara Computers founder Atul Gupta and Altech CEO Craig Venter. here we go again, with the Guptas!!! Why single out the Gupta’s and not the Venter’s? Is Sahara Computers a real player in this space. I mean really now has anybody been to their offices in Cape Town? A guy operating out of a shack in Phillipi has a better setup, its pathetic. I’ve been in the ICT Enterprise space for a while now and I have not had any real dealings with them in the procurement of services or hardware. What do they sell besides cheap desktops? I find “Realist’s” comments rather odd and misplaced in terms of “Travellers’s” question. Whilst I appreciate the positive/negative perception created around the Gupta’s, I find the comparison of Mustek to a Philipi shack operation extremely disingenuous. I have my own opinions about the Venters (and lately Vodacom for that matter), but that is neither here nor there in relation to the subject at hand. It is evident to me that this round table consisted of industry players with a particular profile and that partially explains why the Gupta’s and the Venter’s are included in the list. Really how did they get these names (probably a hat) as I cannot see any of them building factories and training PDI’s to manufacture telecomunication equipment locally creating the jobs the President has promised in his State of the Nation address. Or is this possibly windowdressing.?? Thats where its all suppose to begin! These guys hold considerable power and with knowledge and experience its a good start, I applaud the minister in calling the meeting but again it will be useless if the are no follow up on the critical issues.